Outbrain is the world’s leading discovery platform dedicated exclusively to predicting moments and drawing data-driven connections between interests and actions. With Outbrain Amplify, customers will discover your brand’s message and enable you to target the most engaged audiences. Setting up a campaign on our platform will allow your content to appear as recommendations on the web’s largest premium publisher sites. How does Outbrain Amplify Work? Using a complex set of algorithms and Outbrain’s Interest Graph©, our system pairs your content with readers who will find it engaging and relevant. 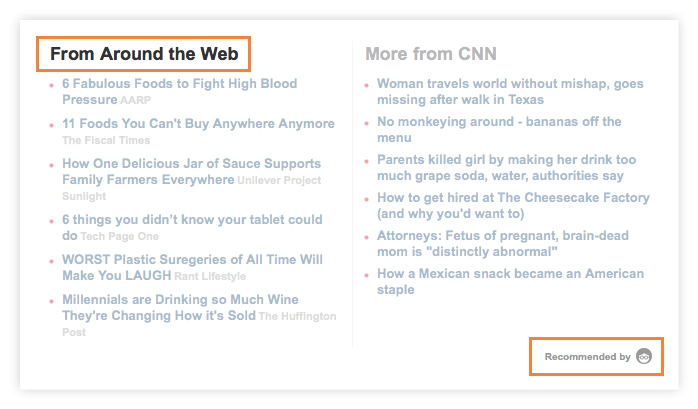 Outbrain algorithms only serve what readers want to read, making us the highest quality discovery engine out there. Not only will we find your best performing content, but you’ll also be in good company. Our readers trust us because we have proven to be the most reputable in the industry. Whether you’re a Fortune 500 company or a small business, Outbrain Amplify is great for any company with captivating content that can be shared with a large, highly engaged audience. Clients use Outbrain for a variety of goals such as driving high-quality traffic to their site, building their audience exposure and increasing new sales leads and conversions. If you want to look beyond your search and social networks to reach new audiences across the web, then Amplify is for you. Still unsure if Outbrain is right for you? Learn more about content marketing and native advertising to get a clearer picture of what we do or reach out to our great support team for more information.